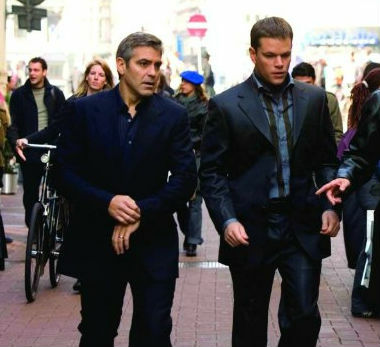 –George Clooney and Matt Damon had a snowball fight and…oops, my ovaries just exploded. -I kind of love that Will Smith just admitted the reason he dropped out of Django Unchained was not actually “scheduling conflicts” but because he wasn’t playing the lead. If only all actors could be so ego-honest. –Liam Hemsworth was spotted at Miley Cyrus’ house. WHAT DOES IT ALL MEAN?!? Oh wait. I don’t care. Carry on. –Aaron Paul just won the internet by Instagramming an adorable photo of him as a little kid. –David Beckham lifted up his shirt to show off his tattoo in China. This is how peace treaties should start. -This is a bit long, but NY Magazine‘s feature on what went down behind the scenes at the Today Show during the Ann Curry debacle is a juicy read. -Apparently, this is what Madonna looks like now. -Speaking of celebrity candids, everyone’s captioning these photos as “Emma Stone without makeup.” Um, she’s clearly wearing a bit of lipstick and maybe even some mascara, but she doesn’t look like a drag queen so I guess that makes it news in Hollywood. –Dennis Quaid and his wife have changed their mind about getting divorced…again. Maybe next time they should just crack open a bottle of wine and avoid the legal fees. -I’m not sure Canada needs its own version of The View, but yay for Lainey getting a talk show gig! –Lindsay Lohan‘s latest film, directed by the ShamWow guy (no, really! ), is a box office disaster, earning a measly $625 per theatre. –Lindsay has reportedly worked it out so that she doesn’t have to start rehab until after Coachella. Aw crap. Is it too late to sell my tickets? -Meanwhile, she was spotted enjoying some PDA with her new boyfriend in a bar (of course). -CBC is streaming the new Charles Bradley album. (His first CD made Rolling Stone‘s top 50 list in 2011.) It’s possible that I listened to “Let Love Stand a Chance” a lot today. Like, a lot. -Just as we were all starting to wonder if there were any good men left, this happened. –Details magazine delved deeper into Dana Martin’s plot to kill Justin Bieber — and revealed that he still wants to finish the job. –Lena Dunham wrote a really sappy essay about her dog, if you’re into that sort of thing. –Lena also directed a short entitled “Best Friends” (narrated by Girls‘ star Adam Driver!) for Rachel Antonoff’s Fall 2013 line. It’s basically a four-minute Noah Baumbach film. Or maybe Wes Anderson (who just made his own fashion films for Prada). -I enjoyed this video of Ian Somerhalder playing dress-up with a cardboard cutout of Paul Wesley way too much. -Speaking of great vids, there’s a reason this one-man acapella cover of “Thriller” is blowing up today. Amazingness! –The Lizzie Bennet Diaries Kickstarter has almost hit $300k in just a couple of days (its goal was only $60k in 30 days). This ones a lot less controversial than the Veronica Mars campaign — these funds will go to creating two new series, as well as paying royalties for a cast an crew that haven’t really been paid (at least not well). -Speaking of Kickstarter campaigns, I really liked the discussion during this NPR podcast about how the Veronica Mars campaign has led to a bit of fan entitlement. If/when supporters think they should have say in the plot, this thing goes off the rails. -Meanwhile, Kristen Bell’s reaction video to the campaign was very cute. –Gwyneth Paltrow is reportedly opening a blowdry bar. -The paparazzi caught Ben Affleck and Jennifer Garner in some adorable family photos — just as a nasty tabloid report surfaced. I’m sure that was a total coincidence, though. -Sweet! Seth Green is coming back to (live-action) TV. He’ll star in Seth MacFarlane’s new show. –Entertainment Weekly posted some pretty great Vines of stars getting slimed at this weekend’s Kids’ Choice Awards. There’s no way Sandra Bullock didn’t get a whole bunch of green stuff up her nose in that one shot. Gross. -Meanwhile, I love that Johnny Depp showed up. He almost always makes an appearance at the big fan-voted awards, which is great. -A new, less-angsty trailer for Iron Man 3 debuted during the Kids’ Choice Awards this weekend. -We also got a new trailer for World War Z, which focuses more on Brad Pitt and his family instead of just a wall of zombies.